In-between the BQE and the Grand Central, nestled behind St. Michael's Cemetery, there's an old hobo encampment in Queens that's been there since the '30s. Since it's still occupied by hobos, it's still just an encampment, but some people like to think of it as a "neighborhood jr". Anyway, everything there is hobo-themed. Like the bread, even when fresh - is baked to look like 3 or 4 bites have already been taken out of it. You should see the stuff they sell at the Urban Outfitters there - rope belts, toeless Timerlands, even high-end camel hair bindlestiffs*. And everyone's got a bit of scruff on their face, cause hobos hate MACH 3 razors. Moms, lawyers, ice cream men - they're all rockin' facial hair. Even the kids have 5 o'clock shadows. 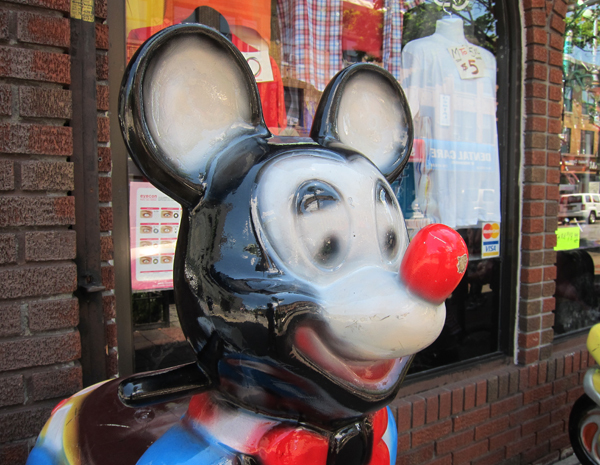 Even the Mickey Mouse Quarter-Rides can't get together the two bits to go see the barber. * A bindlestiff is one of those polkadot bags that hobos carry around on a stick.